Tintagel lurks in a rocky crevasse on the wild north coast of Cornwall. It is one of Britain's most visited spots, the legendry association with King Arthur and the Knights of the Round Table bringing visitors flocking from most parts of the world. 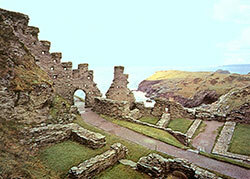 Arthur's birth is said to have taken place in the now ruined castle perched on Tintagel "Island", a rugged peninsula reached only across a narrow causeway. The ruins are of a 12th century castle but excavations have revealed that there was a Celtic monastery and a fortress settlement here dating to the 5th and 6th centuries immediately after the withdrawal of the Romans from Britain. Just the place where a Celtic freedom fighter might have been born! 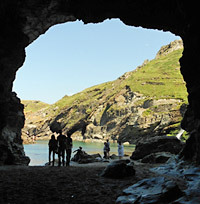 In the cliffs below the castle ruins you can explore Merlin's cave and on the island itself King Arthur's Footprint can be found; both rather dubious relics! There is, however, nothing unreal about the stunning views and heady atmosphere in this regal spot among the cliffs. 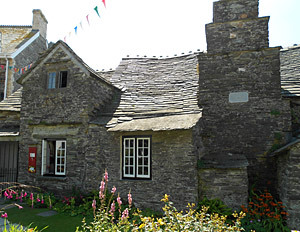 In Tintagel village you can visit the quaint Old Post Office, a 14th century stone built house, in the style of a medieval manor house. For 50 years the house was used as the district postal office. It has been restored and is maintained by the National Trust. Open to the public during the summer.